The UNESCO International Institute for Educational Planning (IIEP-UNESCO), in partnership with UNICEF, hosted a technical Round Table from 18-20 July 2018 in Paris, France, to support ministries of education in planning education systems to include children with disabilities. Children with disabilities remain one of the most excluded groups from education. Of the one billion persons with disabilities worldwide, 150 million are children, according to the World Health Organization. However, there is limited information on who these children are and what their individual needs may be. As a result, countries often do not know how to include children with disabilities in their national education systems. Persisting stigmas, unconducive school design, and a lack of teacher training and appropriate learning materials on inclusive education makes their access to school and learning even more difficult. 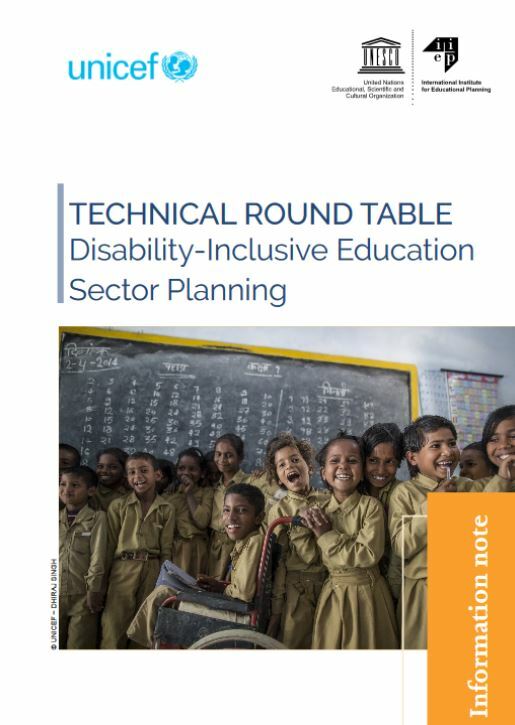 The Round Table addressed these issues by bringing together government experts, development partners, and major national Disability People’s Organizations from eight countries in sub-Saharan Africa and Asia and the Pacific. The participating countries included Cambodia, Ethiopia, Fiji, Ghana, Kenya, Nepal, South Africa, and Viet Nam. Read the information note here. Participants took stock of current practices and opportunities for disability-inclusive educational planning and explored ways to address critical data and capacity gaps. IIEP’s Virtual Campus also hosted a two-week preparatory virtual phase for the participants from 2 July to 16 July, as well as an open livestreamed “Data Dive” with a disability data expert on 10 July. Formulate the capacity needs to be addressed in a future IIEP and UNICEF training programme on inclusive education. Quality education is a fundamental right for all children. Children with disabilities are no exception. It is also the bedrock on which to build global peace and promote sustainable development. Sustainable Development Goal 4 (SDG 4), with its focus on leaving no one behind, provides countries with an opportunity to transform their education systems to become more inclusive and equitable. Inclusive education entails reaching out to all learners and addressing all forms of exclusion and inequalities in access, school participation, and learning outcomes. Effective models for inclusion can help children with disabilities flourish and ultimately play an important and active role in society. Inclusive education is also beneficial for all learners with its focus on diversity and quality and its responsiveness to the different needs of children. After the Round Table, IIEP will continue its collaboration with UNICEF to develop an IIEP training offer on disability-inclusive education sector planning, starting with region-specific distance education courses.